Heritage may refer to something that is or may be inherited. It may be valued objects or qualities such as cultural traditions, historical sites and unspoiled natural environment. The idea of a collective inquiry into the making, gatekeeping and safekeeping of Singapore’s heritage will help its citizens fully understand and comprehend the importance of a country’s heritage in providing shared experiences and formulate a national identity that is perceived as elusive to a young nation like ours. 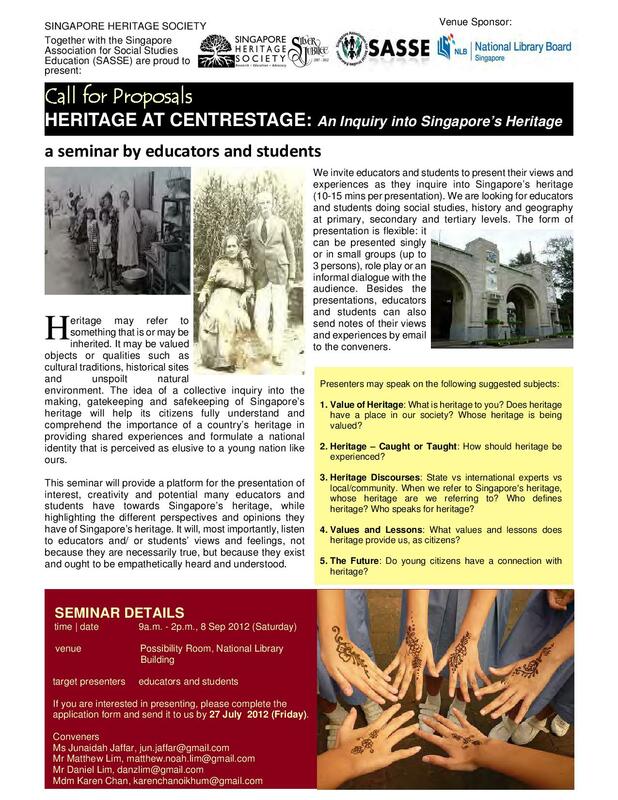 This seminar will provide a platform for the presentation of interest, creativity and potential many educators and students have towards Singapore’s heritage, while highlighting the different perspectives and opinions they have of Singapore’s heritage. It will, most importantly, listen to educators and/ or students’ views and feelings, not because they are necessarily true, but because they exist and ought to be empathetically heard and understood. We invite educators and students to present their views and experiences as they inquire into Singapore’s heritage (10-15 mins per presentation). We are looking for educators and students doing social studies, history and geography at primary, secondary and tertiary levels. The form of presentation is flexible: it can be presented singly or in small groups (up to 3 persons), role play or an informal dialogue with the audience. Besides the presentations, educators and students can also send notes of their views and experiences by email to the conveners. Value of Heritage: What is heritage to you? Does heritage have a place in our society? Whose heritage is being valued? Heritage – Caught or Taught: How should heritage be experienced? Heritage Discourses: State vs international experts vs local/community. When we refer to Singapore’s heritage, whose heritage are we referring to? Who defines heritage? Who speaks for heritage? Values and Lessons: What values and lessons does heritage provide us, as citizens? The Future: Do young citizens have a connection with heritage? Please download and complete the APPLICATION FORM. All applications should be submitted to the conveners (as indicated in the form) by 27 July 2012.